The X19-CR Dominator is the Super Pocket Bike of choice for canyon carving and road racing. Designed for superior tossability and grip, the X19-CR ( Club Racing Edition ) is a track bike dressed up as a super bike for the road. The suspension has been completely recalibrated for maximum grip and stability for the deepest knee-to-the-ground cornering. Stiffer springs, damper settings and rebound rates ensure minimal squat and nose dive in heavy acceleration and braking. The lower ride height not only looks better, it also lowers the center of gravity and maximizes aerodynamics, giving these super pocket bikes top honors in the handling department. The Honda®-Based 110cc 4-Stroke powerplant comes from the X18-R, but retuned for low-end bias response. The race-tuned dual exhaust pipes were fabricated to give maximum low and mid range power by carefully regulating backpressure and exhaust velocity. The shorter gear ratios and final drive of the X19-CR result in better response down low. Acceleration numbers where it counts most (from a dead stop or exiting a tight turn) beats out every other super pocket bike, every single time! The Sequential Manual Gearbox has also been beefed up to handle the extra torque. Power shifting (shifting without using the hand clutch) is also possible with this heavy duty, race ready gearbox. We at MiniPocketRockets were even able to chirp its wide, semi-slick race compound tires on the 1-2 shift using this method. But for less intense situations, the hand clutch can be used. And for those that may not feel comfortable kicking your own gears, there is an Automatic Version of the X19-CR developed just for you! Being EPA Certified & Legal, we had to make the Club Racing version of this X19 track-ready just like all of our other Super Pocket Bikes. So we've included our ZR alternator, horn, digital/analog gauges that includes a 70 mph speedometer, status lights and a backlit digital readout of what gear you are in at a glance. 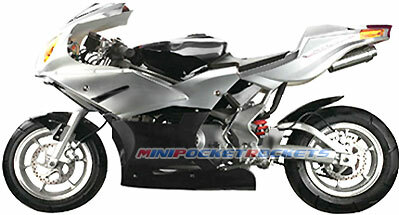 And like the rest of our Super Pocket Bikes, the X19-CR Dominator comes fully assembled and ready to race right out of the box. All of its Race-Tuned parts comes pre-installed at the factory to ensure perfect fitment and is covered under our all-inclusive warranty. If taming curves and ripping through tight bends in a track-oriented super pocket bike is your thing, the X19-CR Dominator is the machine for you. And remember, power really is nothing... without control! Included Free with our Super Pocket Bikes: Ignition Keys (2), Tools (sockets, screwdrivers, allen wrenches), Tool Case, Spare Fuses, Owner's Manual / Certificate and our free extended warranty.